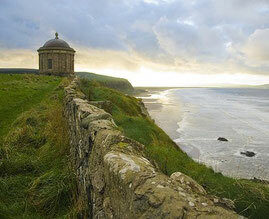 Mussenden Temple is another iconic sight of the North Coast. It is a circular folly on the estate of the Bishop of Derry, at Downhill. It is perched spectacularly on top of a cliff with views across the many miles of sand at Downhill, towards Donegal.